Juche ideology emphasizes North Korea's political, economic, and military self-reliance. 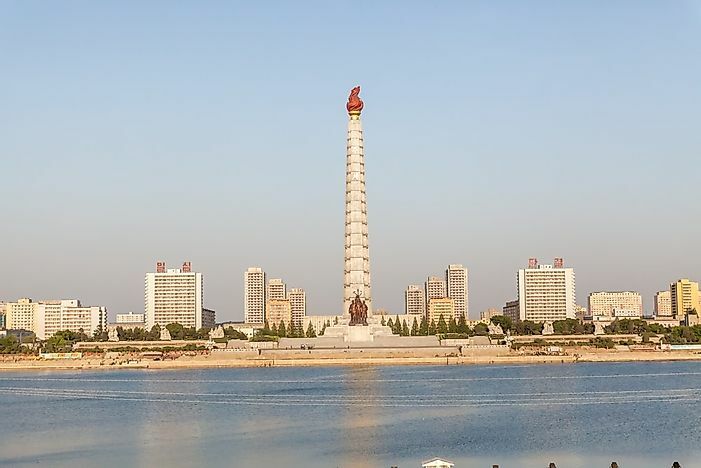 The Juche Tower in Pyongyang was constructed to celebrate Kim Il Sung's 70th Birthday in 1982. The Juche ideology emphasizes North Korea's political, economic, and military self-reliance. It became the state ideology and sole guiding principle of the government following the rise of a one-party communist state in the country following World War II. Juche asserts that the individual is the master of one’s destiny and encourages North Koreans to work as masters of revolution and construction. This political ideology is based on the idea that man is the master of everything who decides everything. The government of North Korea attributes the origin of the Juche ideology to the late Kim II-sung's experience in the struggle against the Japanese occupation during World War II. Its first documentation occurred in 1955 in Kim's speech which was delivered to promote a political purge. He saw that the revolutionaries did not find the need to go among the masses to enlighten, orchestrate, and trigger them to wage resistance and war to free themselves and, therefore, decided to use that approach which eventually gave the country the freedom. When he came to power, he emphasized on the participation of the masses and the blind belief in the Korean military and called his approach "juche." Following the Korean war, when South Korean was backed by the United States and North Korean was supported by the Soviet Union, North Korean society became more insular. At this point in Korean history, the Korean government put a heavy emphasis on re-building the economy to a place of self-sufficiency, which aligns with the philosophies of Juche. According to the Juche ideology, it is through subordination to a great leader that the masses can achieve self-reliance. The Kim family stands at the center of this fact. Since the introduction and implementation of this ideology, it has placed the Kim micro-family unit at the head of a nationwide macro-family, with Kim II-sung as the father figure and the North Korean people as his children. Therefore, the Koreans live under a virtual umbrella of brothers and sisters, people of one parent and look up to the Kim family to offer guidance and direction. North Koreans transferred the full party of nationalism in the family by positioning Kim II-sung as the universal patriarch, and in effect, North Korea's familial nationalism has superseded the somewhat theoretical, class-oriented language of socialism with a more easily comprehensible and identifiable language of familial connections, love, and obligations. North Korea rest all its political power in the monarchy of the Kim family guided by the Juche principles of the worker's party of Korea, where the son or immediate member of Kim's family automatically takes over the leadership of the country upon the death of the preceding ruler. The Juche ideology of North Korea is not only a political idea, but also impacts all aspects of the Korean life spiritually, socially, and economically. The masses recognize it as a tool for self, political and economic independence, building a belief in the great leader that translates into a personality cult. The idea aims at maintaining an independent and creative standpoint in finding solutions to the problems that may arise from revolution and construction. It implies solving these problems by man's effort and in conformance with the actual conditions of one's country and politics.